This strange looking globe standing in Victoria Embankment Gardens just off Savoy Place may appear just another random piece of street art but in fact it’s a memorial to a man and his family who established the hotel now housed nearby. Theatre impresario Richard D’Oyly Carte is known for having formed his own opera company – the D’Oyly Carte Opera Company, it was known for staging Gilbert and Sullivan’s ‘Savoy operas’ – and for having founded the Savoy Hotel, which stands across the road from the memorial’s location. 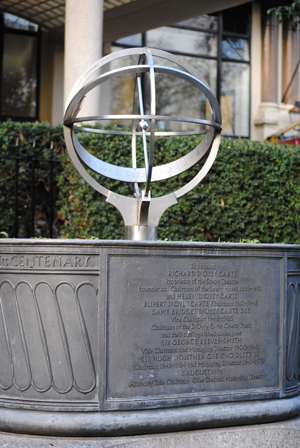 The memorial, which was placed here in 1989 to mark the hotel’s centenary, takes the form of an armillary sphere – a model of objects circling the earth – standing in the middle of a cistern. The inscription accompanying the memorial states that it honors not only Richard D’Oyly Carte but also others – including members of his family – who have since been involved in the hotel’s management. There’s also a note on the rim of the cistern, stating that the garden was “given to London by the Savoy in celebration of its centenary” while inscribed on the armillary sphere’s rings are the words “Savoy Centenary 1989, ‘For excellence we strive. '” and a line from dramatist WS Gilbert (of Gilbert and Sullivan fame) – “Every season has its cheer, life is lovely all the year”. Really enjoy your posts… keep up the great work! Appreciate the comment…It’s certainly a labour of love!